Given the nature of the threats, the value of ecosystem services delivered, and the importance ofecosystem management, there have been many studies of ecosystems in coastal lagoons. As noted above some of the ecosystem studies have been in the form of major multidisciplinary programs. The knowledge obtained has then frequently been encapsulated in various kinds of predictive ecological models which attempt to provide answers to 'what if' questions from environmental managers and engineers seeking to implement catchment works or reductions in wastewater discharges. The ecological models are driven by the hydrodynamic models described above - the physical setting provides the basic context for the ecological response. In many cases the knowledge has also been built into a variety of EIS and risk assessments which attempt to judge the possible detrimental effects of land-use change, port construction, harbor dredging, and other engineering developments in urban and industrial areas. Despite the pandemonium of interactions between species in coastal marine systems (or perhaps because of it), there are some high-level empirical relationships which can be used for diagnosis and management. Much as Vollenwieder discovered in lakes there are some predictable high-level properties of coastal marine systems. For example, the total algal biomass (as chlorophyll a) responds to N loads just as lakes respond to P loads. This is further evidence of the importance of N as a limiting element in marine systems, and for the key of P as the limiting element in freshwater systems. The differing biogeochemistry of marine and freshwater ecosystems is explicable on the basis of the evolutionary history and geochemistry of the two systems. The existence of a relationship between N and algal biomass is evidence for a kind of 'envelope dynamics' of these diverse systems. N does not limit growth rates of the plankton so much as the overall biomass. As a result of high growth rates, grazing, and rapid nutrient regeneration in surface waters, the total community biomass reaches an upper limit set by the overall rate of supply of N. This is a form of 'extremal principle' of these pelagic ecosystems which indicates that with sufficient biodiversity then an upper limit to maximum nutrient use efficiencies can be reached. A similar model of high-level ecosystem properties has been developed in which some fundamental physiological properties of phytoplankton (the slope of the P vs. I curve at low light and the maximum photosynthetic rate) are used to develop a production model based on biomass, photosynthetic properties, and incident light. This amounts to saying that even in shallow coastal systems it is possible to get some reasonable empirical predictions of the physiological (photosynthetic parameters and nutrient uptake efficiencies) and ecosystem responses to some driving forces (nutrient loads and incident light). and the ratios of elemental turnover set limits on the overall system performance. The predominant element ration in pelagic marine organisms is the Redfield ratio (106C:15N:1P). This aspect of the biogeochemistry of coastal lagoons has been used in a global comparison of the biogeochemistry of these systems by the IGBP LOICZ program. Knowing the loading rates of major nutrients, the concentrations of nutrients in the water column, and the rates of tidal exchange allows simple mass balance models of C, N, and P to be constructed. The salt and water budget of these systems can be used to obtain bulk hydrological fluxes. Making stoichiometric assumptions via the Redfield ratio about fluxes of C, N, and P (as well as oxygen) in the plankton and across the sediment interface allows estimates to be made of the overall autotrophic-heterotrophic balance of the system as well as nitrogen fixation and denitrification rates (essentially by estimating the 'missing N' based on the C, N, and P stoichiometry). These techniques have made it possible to do global comparisons of the biogeochem-istry of lagoons around the world and to examine the effects of inflows, tidal exchanges, and latitude or climate. This has been a major contribution to the knowledge of the ways in which major elements are processed and transported from the land to the ocean through the coastal zone. The overall impression is that pristine lagoons (loaded by largely organic forms of C, N, and P) are mostly net heterotrophic and strong sinks for N through denitrifica-tion. More eutrophic systems with higher N and P loads (and more of those in inorganic forms) tend to be net autotrophic and, if dominated by cyanobacterial blooms, net N fixing systems. Decomposition of these blooms may be sufficiently rapid to cause anoxia in bottom waters and lead to the cessation of denitrification and the export of N (as ammonia) on the falling tide. Warm temperate and subtropical lagoons - with low hydrological and nutrient loads - seem to have higher denitrification efficiencies than temperate systems. They are often heterotrophic and strongly N limited systems. An extreme is Port Phillip Bay in Melbourne which has low freshwater inflows, high evaporation, a long water residence time (c. 1 year), high denitrification efficiency (60-80%) and is so N limited that it imports N from the coastal ocean on the rising tide. Temperate lagoons and estuaries have higher freshwater and nutrient inflows, are more eutrophic (autotrophic), and are exporters of N. Temperate systems are therefore more likely to show occasional P limitation. Overall, the cycling of the major elements is driven by the stoichio-metry of the major functional groups of organisms. Thus in biodiverse ecosystems it is possible to obtain some high-level state predictors from a knowledge of key drivers and the basic physiology and stoichiometry of the dominant organisms. The predictions so produced are not perfect but they do capture a large fraction of the behavior of these systems. At this level these models can be used for the management of nutrient loads to coastal lagoons. Many of the questions that are asked of ecologists studying coastal systems are of a more detailed nature and relate to loss or recovery of major species, functions, or functional groups - ecosystem services and assets if you like. Examples would be dominant algal groups, sea-grasses, macroalgae, denitrification rates, benthic biodiversity, fish recruitment, etc. At this level a large number of dynamical ecological simulation models of shallow marine systems have been constructed. There is much more uncertainty in the ecological models than there is in the physical models. Much of the required ecological detail is unknown, key parameters can be ill-defined, the data are usually sparse in space and time, and the computational resources are not adequate to the task of a complete simulation of the entire system. Ecological models are therefore abstractions which attempt to represent the major ecological features and functions of the greatest relevance to the task at hand. Nevertheless, 30 years of research in lagoons and coastal systems around the world have uncovered a number of major functional groups and ecosystem services which, when coupled together in models, give some guide as to the overall ecological responses. The generic models of coastal systems use two basic functional components. A nutrient, phytoplankton, zooplankton (NPZ) model for the water column, and a benthic model incorporating the necessary functional groups - macroalgae, zoo- and phytobenthos, seagrasses -with the groups chosen to represent the particular system of interest. All functional groups are represented by their basic physiologies and stoichiometries and the interconnections (grazing, trophic closure, decomposition, and denitrification rates) are represented by established relationships. The NPZ models adequately predict the average chlorophyll of lagoons and, when coupled with 3D physical models, can give predictions of the spatial distribution of algal biomass in response to climate and catchment drivers. For reasons which will become clear below, these models only predict average biomass levels and cannot predict all the dynamics of the various trophic levels. The coupling between the plankton and the benthos in lagoons is nonlinear and results in some strongly nonlinear responses of the overall system to changes in nutrient loads. Basically, there is competition between the plankton and the benthos for light and nutrients which can drive switches in system state. Thus, lagoons, much like shallow lakes, may show state switches between clear, seagrass-dominated states and turbid, plankton-dominated states. The major driver of the state switches is the high denitrification efficiencies exhibited by the diverse phyto- and zoobenthos in lagoons with strong marine influences. As long as there is sufficient oxygen in bottom waters, diverse zoobenthos burrow and churn over the sediments causing extensive bioturbation and 3D structure in the sediments. Clams, prawns, polychaete worms, crabs, and other invertebrates set up a complex system of burrows and ventilate the sediments through feeding currents and respiratory activity. Given sufficient light at the sediment surface the phytobenthos (particularly diatoms, the microphytobenthos, MPB) photosynthesize rapidly and set up strong gradient of oxygen in the top few millimeters of the sediment. These gradients, together with the strong 3D microstructure of the sediments set up by the zoobenthos, favor the co-occurrence of adjacent oxic and anoxic microzones which are required for efficient denitrification. N taken up by the plankton sinks is actively denitrified by the sediment system. In marine systems the abundance of sulfate in seawater ensures that P is not strongly sequestered by the sediments. Thus, the basis of the LOICZ models lies in the efficiency of denitrification of N in sediments and the more or less conservative behavior of P in these systems. These ecosystem services are supported by the high biodiversity of the coastal marine benthos. In lagoons with higher nutrient loads, the entire ecosystem may switch to an alternative state. Increased N loads stimulate the growth of plankton in the water column and shade off the MPB. The increased planktonic production sinks to the bottom depleting oxygen and reducing the diversity of zoobenthos, restricting the community structure to those species resistant to low oxygen concentrations. Active decomposition in anaerobic sediments together with reduced bioturbation leads to the cessation of denitrification and the release of ammonia from the sediments. So instead of actively denitrifying and eliminating the N load, the system becomes internally fertilized and algal production rises further. This is analogous to the internal fertilization of eutrophic lakes through the release of P from anoxic sediments. In both cases the switch is caused by a change in redox conditions and the change in performance of suites of microbial populations. Once switched to a more eutrophic state (algal bloom dominated), these lagoons do not easily revert to their clear and macrophyte dominated state. Loads must be strongly reduced to get them to switch back - something which may not be possible if the catchment has been modified by urban or agricultural development. There is thus evidence for strong hysteresis in the response of these ecosystems to various impacts. The overall biodiversity and nutrient cycling performance of coastal lagoons therefore depends on the relative influences of marine and freshwaters, the differing biodiversity of marine and freshwater ecosystems, the relative C, N, and P loads to the plankton and the benthos, and on seasonality, latitude, and climate drivers. 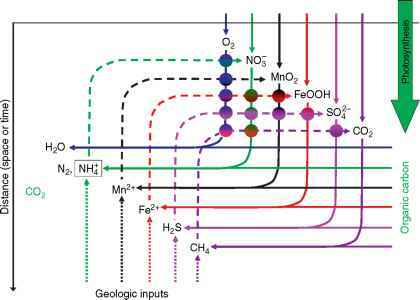 Nevertheless, at least the broad features of their behavior can be explained and predicted on the basis of sediment geochemistry, and the stoichiometry and physiology of the major functional groups in these ecosystems. Empirical work on a number of lagoons up the east coast of Australia allowed Scanes et al. to effectively determine the response of 'titrating' these systems with nutrients. As the N load to the lagoons was increased, seagrasses were lost and algal blooms were stimulated. Even at a crude level of visual assessments it was possible to rank these systems in order of loading and to show that the pattern of response was entirely similar to that predicted by the models (Figure 2). Thus, despite difference in biogeochemistry and biodiversity, shallow lakes and coastal lagoons have broadly similar response to increased nutrient loads and other forms of human impact. Even broad indicators of system state reveal consistent patterns of change. Figure 2 The empirical 'ecosystem titration' relationship between catchment N exports and the resulting ecosystem state in 17 coastal lagoons on the east coast of Australia. Ecosystem state is defined as 1, pristine; 3, showing marked seagrass loss and the growth of macrophytic algae; 5-6, dominated by nuisance algal blooms (some of which may be toxic). Data from personal observations and reworked from Scanes P, Coade G, Large D, and Roach T (1998) Developing criteria for acceptable loads of nutrients from catchments. In: Proceedings of the Coastal Nutrients Workshop, Sydney (October 1997), pp. 89-99. Artarmon, Sydney: Australian Water and Wastewater Association. with larger freshwater inflows and higher productivity may export N and be frequently P limited. As the LOICZ program intended, we have managed a broad understanding of the ways in which the coastal zone influences the transport of major elements from land to ocean.